What is going on? 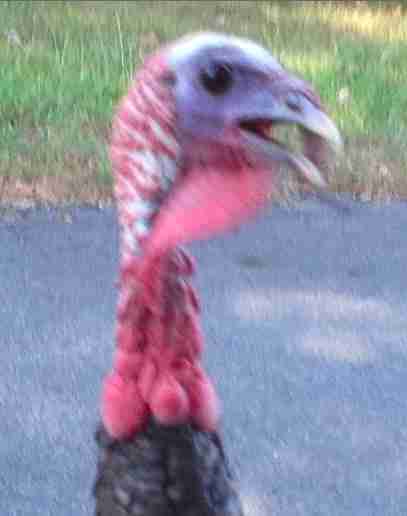 This turkey on this particular road has attacked my husband's car numerous times. He's even got a schedule: every day at exactly 4:00 p.m., there the "demon" is. 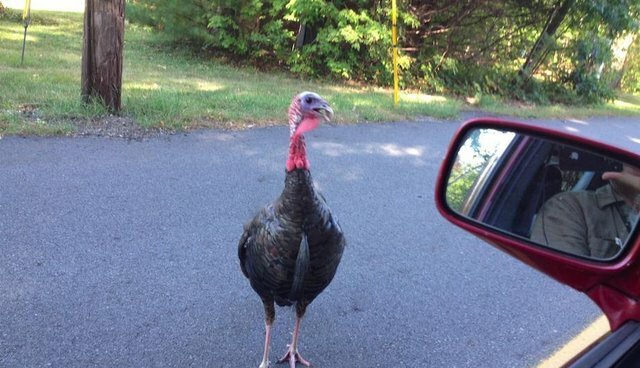 He hogs the road, swaggering back and forth between the futilely honking cars he's blocked in both directions, pecking at tires and staring down drivers through windows left open in the end-of-summer heat. People roll their windows up faster than African safari park visitors who fear being mauled by lions. I had to figure out the story of why we are suddenly overrun by turkeys. There had to be one. And indeed, there is! Wild turkeys, once as common as deer in pre-Colonial times, were nearly extinct a century ago after relentless predation and habitat destruction by European settlers and all who came after them. But thanks to an amazing wildlife management plan that involved large, baited nets concealed on the ground that were then propelled by teeny rockets (I'm not kidding) over unsuspecting birds, thousands of them got relocated and started feeding and breeding all over the place. We now have over seven million of them! "Wild" turkeys now roam all states but Alaska, many of which never originally contained a wild turkey population, so today's turkeys might be considered an invasive species. It's a wildlife biologist's best dream - and worst nightmare - that they've done so well, but if you're simply trying to get across the parking lot at Walmart in some random suburban town without being chased and viciously pecked, this is nothing but the stuff of nightmares, conservation success story be damned. 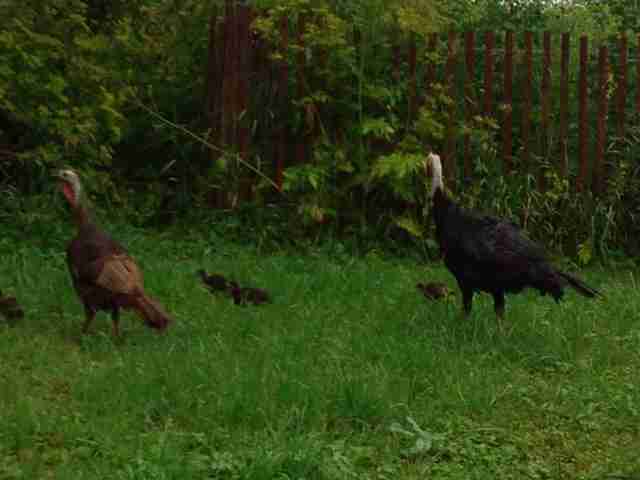 Here's a turkey family my husband and I saw on the side of the road in northern Vermont, so we stopped the car to sneak up on them and take pictures, because see those precious babies? How could we not? We avoided any ill-fated drama by hightailing it back to our car the second the tom put a bead on us. Like so many Americans of the Facebook and YouTube generation, we had spotted our iPhone quarry, but our quarry turned the tables on us. With an angry papa bird in hot pursuit, we dove for cover in our Mazda 3 hatchback and sped away. One of the things I wondered about was whether all of these turkeys we're seeing in different places are the same species or different species. It turns out there are now five geographically and genetically distinct subspecies. By rocket-snaring and relocating innocent turkey families all over the continental US and Hawaii, we've messed with their genetic make-up because they've hybridized themselves in the wild. I have no idea whether that has affected their behavior, making them eager to impose martial law on neighborhood cul-de-sacs. Thinking about parallels with bears, skunks, deer, and coyotes, our encroachment on turkey habitat paired with the ready availability of food in human habitat may be what's spurring these birds to fearlessly commandeer golf courses and hunt beleaguered mail carriers. In closing, here's a grainy close-up of my husband's turkey friend's head, neck and wattle, because he's a beaut. Angry, but a beaut. And here's the best Wild Turkey FAQ on the internet, because you probably have a lot more questions about what's going on with turkeys than I can answer, and this resource is hilariously lengthy and esoteric. I gobbled it up.